Branding is everything, and as an artist you have a lot of freedom to craft exactly how you are portrayed in public. So much freedom that it’s actually a little overwhelming. Your brand is a compilation of images, styles, words, and compositions that make you unique and set you apart from other artists. Who are you? What’s your style? What are you trying to gain from your online presence? What kind of work do you do? Discovering and creating your brand involves a lot of introspection. You are an artist and you have a brand that is true to you and I want to help you speak that truth. By genuinely and accurately portraying your work and your personality on Instagram, you can attract a meaningful group of followers. At the moment, if a potential follower were to look at your profile, would they know what you are about? Would they know your primary medium? Would they be able to learn about your personality? Would they clearly see that you are a professional artist that’s open for business? How do you want people to see your personality? Once you know more about yourself and art, you can use the following tips to accurately communicate your brand to your audience. Choose a catchy, clean, and creative username. Try not to use symbols, underscores, or gibberish in your name. If you are talking to a person face to face and they ask you your Insta name–is it easy to say? Is it catchy? Or did you just spend 2 minutes telling them where the underscore is and how many numbers go between your first name and favorite fruit? Pick a great profile photo. If you work with bold colors, showcase this. If your brand focuses more on you as a person, include yourself in the photo. Do you have a business logo? Use great lighting and choose a photo that can describe your whole brand. Tell people a little about yourself. Space is limited, so use a couple of key things about you like the medium you use, where you are from, what you love, etc.. Check out a couple of your favorite artists you follow to see how they do it. Make sure to link to a website. Whether it’s your online shop, a blog, or FB page. If people want to know more about you, make it easy for them to do so. Your profile should look cohesive. All posts should be connected in some way. Even though I know artists are often multifaceted and have a diverse skill set, it’s hard to effectively showcase everything you do AND grow your following. 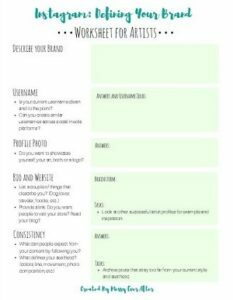 When you are branding yourself, you need to narrow your focus on the content you post (I’m still struggling with this!). Do you have a color palette that you use regularly? Do you have signature style? What do you create most often? What can people expect from you when they follow you? It may feel limiting, but think of your profile as a digital gallery of your work that should flow together in some way. Whether it’s the art you create, or the space you create in. @rey.fritsch creates consistency with including herself in each photo. Her work lately has been focused on canine subjects and all of her photo compositions have a similar feel. @saracaudleart uses the same color scheme and ocean inspiration for her posts and art. Also, consider putting content that is a little less polished in your story. This way, you can still share more about yourself without sacrificing the posts on your profile. Use your voice. Write interesting captions. Captions are a great way for you to tell a story about yourself and your art. Don’t limit yourself to just stating the size and medium of your work. Encourage engagement and start a conversation around your posts. What kind of tone do you want to communicate? I always try to inspire, spread positive energy, and not take myself too seriously with each post of mine. My topics include memories from art classes, experiences in the art world, expressing gratitude, sharing my woes of art block and lack of confidence, and random light-hearted things like just how much I like cheese. Give your audience a sense of who you are and create meaning behind your art. Of course I have boring posts that get right to the point for sales, new items in my shop, blog posts, etc..
Part of your brand will involve how you treat your followers and potential customers. You are a business now so make sure you have good customer service. Always respond to messages. I’ve gotten multiple messages from people, and at the end of the conversation they expressed gratitude that I responded, because they’ve reached out to many artists and rarely got a response. Reply to comments from followers. If they made an effort to compliment you, thank them. Not only is this kind, but it also increases engagement on your posts. Your art and the photos you post are going to be the most defining aspect of your Instagram account. Unpolished art can look great in a photo, and incredibly skilled work can look terrible. It’s important to learn the basics of taking a great photo, put quality content out there, and always work on improving your skills. Limit your work in progress photos to images that are 75% finished or more. The ‘ugly’ phase of art may find a better home in your story. No matter where you are in your art career, always work towards growing your skill set and evolving as an artist. It’s okay to not have a completely polished profile when you first start. You don’t have to be perfect immediately or know exactly what your brand is when you are just starting out. A lot of this can be discovered and tweaked over time. The important thing is that you have an awareness of branding and periodically review your post content and see what’s working for you. To be honest, Messy Ever After was born in 2014 and it took me 3 years to figure out who I am and find my direction. Also, make sure you are using the best hashtags for your posts! If you are hoping to get your artwork out there and grow your following, I encourage you to take a look at your profile and review the points above. 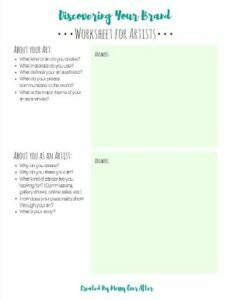 I’ve created another free worksheet to help! If you have any questions about branding in general or want help with your personal brand comment below or reach out to me directly. I’m always happy to offer my consulting services to other artists. Thanks so much for the info you share. It’s incredibly helpful ! I’m trying to get growth on instagram and feel I need to refine my brand image. As I paint both ocean and landscapes in mixed media it creates a lack of cohesion on my insta page. Maybe I will just post ocean inspired artworks. I guess it’s trial and error for a while. You are very welcome! I am always happy to help! Trial and error is definitely part of the process. Let me know if you ever want a second opinion on your profile! I do Instagram reviews every now and then for motivated artists.